Can Colonel O'Neill and Crew Survive Stargate SG-1 Unleashed? Seeking to prolong the magic of the popular science fiction television series, Arkalis Interactive gets the original Stargate SG-1 gang together for one last big score. Having a cohesive cast of season actors voicing familar characters is great. Having a cohesive game would have been better. 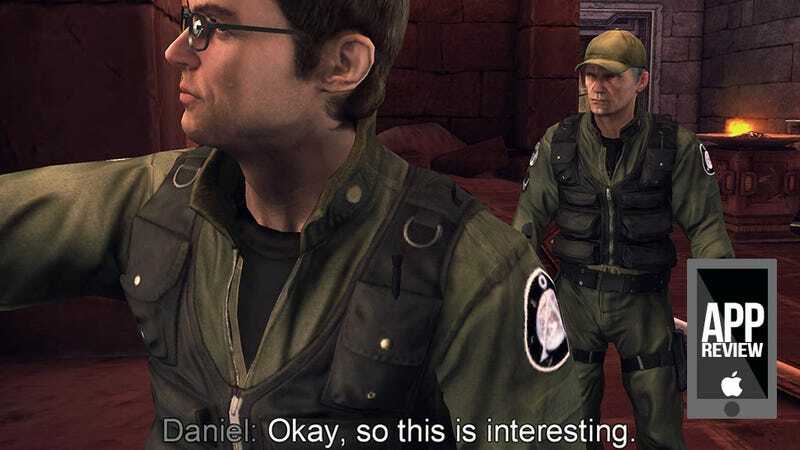 Building upon their experience with Stargate Command, a series of mini-games presented without much context, Arkalis presents Stargate SG-1 Unleashed — Episode One (of three), a series of mini-games with plenty of context. A new Goa’uld threat rises from Time-Life Books' Mysteries of the Ancient World, and it's up to O'Neill, Carter, Jackson and Teal’c to save the universe from something something Egypt. The best feature of this game, at least for fans of the long-running show, is the voice acting. Richard Dean Anderson, Amanda Tapping, Michael Shanks and Christopher Judge reprise their roles as the fab four, and though the chemistry of having them all in the same scene is completely lost and the dialogue stilted and often forced, just hearing their words is a comfort to the fans that weren't completely sick of the characters by season seven. Oh, and the graphics aren't bad at all for a mobile game. That's nice too. It's gameplay where Stargate SG-1 Unleashed falls apart. One minute you're in a bad corridor cover shooter — little more than a shooting gallery. Then you're in a 3D adventure game, performing fetch quests while the world's jankiest camera attempts to give you motion sickness. Timed action pokes its head in to shoot you with insta-kill trap arrows. There's a mini-game where you attempt to save a person's life — even if you succeed, they die. And let's not forget stealth Daniel Jackson. He's a doctor. Between the voice acting and the storyline, written by prominent Stargate novelist Sally Malcolm, Unleashed really nails the authentic SG-1 feel. If Arkalis Interactive lost the interactive bits, they'd have a pretty nifty little animated episode on their hands. This might be the first time I've ever wished a video game didn't have so much game in it.